The 15-Day Cleanse is an all-natural way to cleanse the colon and is designed to promote optimal colon health. The key to a healthy digestive system is a healthy colon. The main function of the colon is to eliminate waste through regular, healthy bowel movements and thus preventing harmful toxins from building up inside the body. Keeping your colon clean will help prevent many potential health problems. Because a great part of your immune system resides in the gut, it is very important to keep it clean for optimal health. The 15-Day Cleanse is convenient and an effective way to get rid of harmful toxins in your body and restore your overall well-being. A healthy colon needs bulk to eliminate regularly. It is recommended that you include fermented foods like yogurt and fruits and veggies in your diet, drink plenty of water and get plenty of exercise. 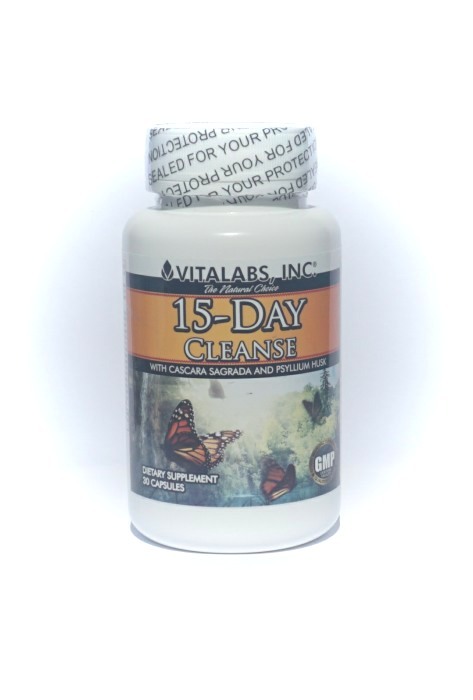 The 15-Day Cleanse is a potent herbal colon formula that promotes the elimination of waste and toxins to help you feel rejuvenated. SUGGESTED USE: FOR OCCASIONAL USE ONLY: 1 to 2 capsules taken at bedtime with 8 ounces of water or as directed by a healthcare professional. Do not exceed recommended dose. This product contains senna leaves and cascara sagrada. This product should be consumed with at least a full glass of liquid.